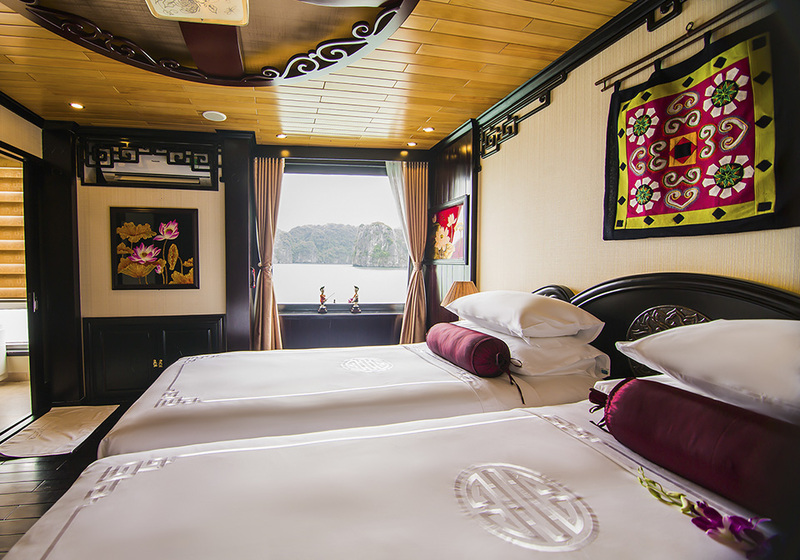 We at Indochina Sails are excited to announce the introduction of a new and improved luxury cruiser that will be based on the waters of the more exclusive southern part of Halong – Lan Ha Bay. This exquisite cruiser will be top of the range and her maiden cruise in early 2019 is fast approaching. Lan Ha Bay is comprised of over four-hundred tropical islets with secluded sandy beaches and has managed to retain a relatively pristine environment by avoiding substantial tourist attention. Discover an array of natural wonders including Cat Ba Island – Lan Ha’s most iconic resident. This tropical oasis is the largest landmass in the Halong Bay complex, stretching over an area more than 200km2. Officially recognized by UNESCO as a World Biosphere Reserve, Cat Ba is famous for its limestone mountains, extensive cave systems, tropical forests and casual island lifestyle. Indochina Sails’ Lan Ha edition boards at 12:30 pm every day. Enjoy a complimentary drink and take a seat in the lounge before a short welcome briefing with fellow guests. Become acquainted with the ship facilities and itineraries, using the opportunity to ask any questions whilst getting to know the staff. 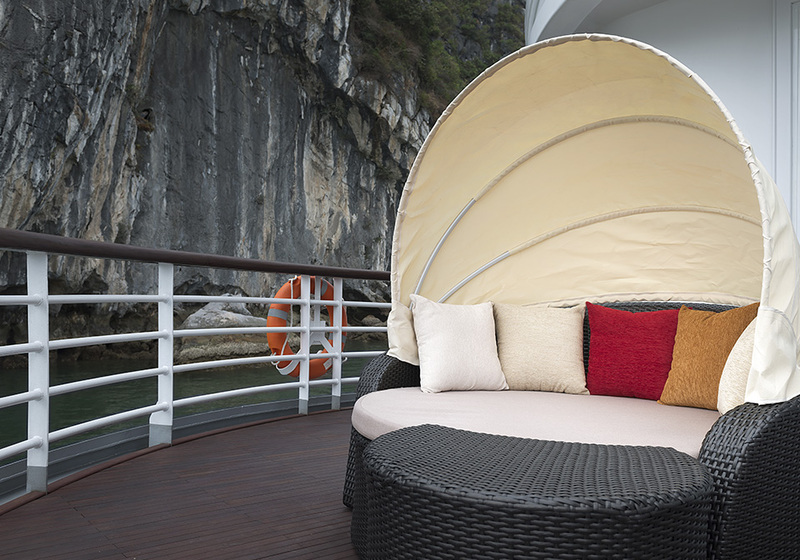 Take some time to adjust to your luxurious floating home. You’ll be shown to your room where you can unpack your belongings enjoy the bedroom balcony view before freshening up just in time for lunch. As you indulge in an exquisite & freshly cooked meal, the boat sets sail for the first attraction of the day – Lan Ha floating fishing village. With an estimated population of hundreds residents, this fishing village is a unique cultural feature of the region, representative of the ancient sea-based lifestyle and heritage of the local people. Interact with the friendly communities whose livelihoods depend on these waters, and learn to fish in their traditional style. Back on board the boat enjoy some free time whilst we drift deeper into the tropical island complex. 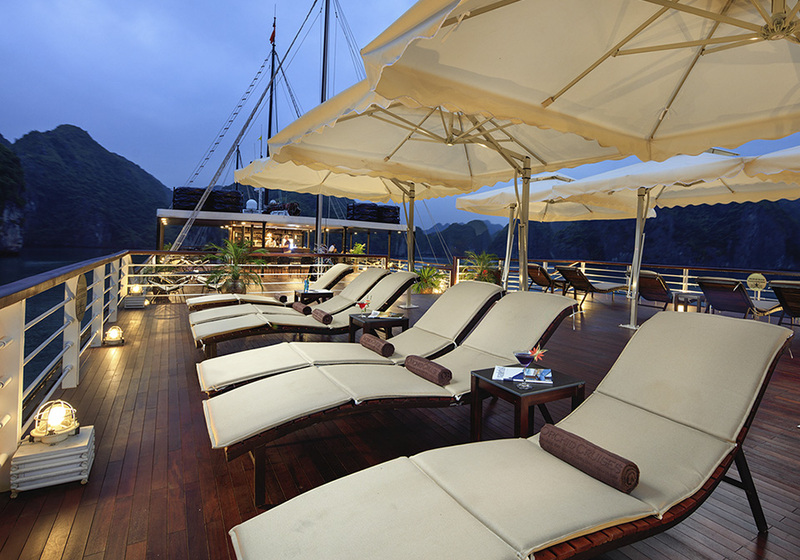 This is a perfect time to check-out the panoramic sundeck, relax in your room or acquaint oneself with the bar. After ninety-minutes, our head chef will lead a cooking class and food carving lesson – a typical feature of Vietnamese culinary culture. Watch in wonder as mere vegetables are carved into life, and try your hand at making a typical Vietnamese dish. A la carte dinner meals platter ranges from salads to sea food and meat dishes to seasonal fruits and deserts. Happy hour duly follows dinner, and you can spend the rest of your night as you wish. Board games are available for some friendly competition, you can try your hand at squid fishing with our staff, the sundeck is most atmospheric at this time, and the lounge furniture becomes increasingly alluring – and all that is if you can resist our luxury spa service. Start your day with a sunrise Tai Chi class upon the sundeck as the day breaks on the calm lagoon. Treat yourself to European-style pre-breakfast snacks with tea and coffee before we set sail to one of our favorite spots in the whole of Ha Long Bay, Ong Cam bay. 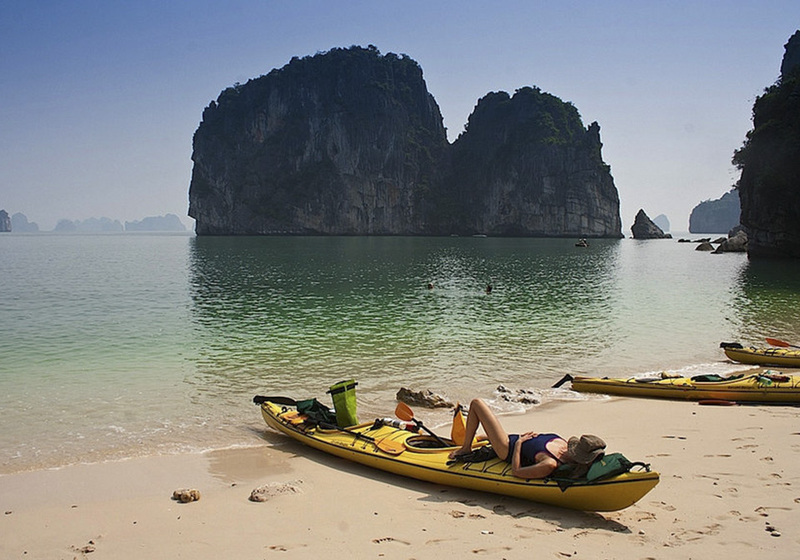 This breathtaking cove is the perfect morning chill-out spot, with guests given the choice between sunbathing, swimming or kayaking around the rocky shoreline. Once we’re done on the beach, we board the boat again just in time to enjoy a full breakfast buffet, which includes both international favorites and typical Vietnamese dishes including traditional Vietnamese Noodles (Pho). After breakfast guests may relax in the dining room and lounge or on the deck enjoying the last Bay views before disembarkation at 11:00 am. Our on-board ‘Tonkin’ and “Annam” restaurants are run by award-winning chefs serving à la carte and set menus. Our experienced chefs provide a varied selection of Vietnamese and International cuisine with an emphasis on locally caught seafood to offer the truest taste of local cultures. Beyond the food, the architecture of the dining area adheres to a vintage colonial past with art galleries, open space and antiques. On-board bars offer a selection of Aperitifs, Spirits, Cocktails, Beer and a selection of fine Wines from around the world.